Helen Hunt and Tom Irwin lead a world-class company of American actors and musicians in our 25th Anniversary production directed by our own Ben Donenberg on a grape-stomping California vineyard, ripe with music by Lyle Lovett, performed by Sara and Sean Watkins. Wine flows, laughter rolls, music soars, as unlikely lovers discover themselves and each other in one of Shakespeare's masterpiece comedies. "...Yet here is an example of a show whose glittering individual parts lose some luster when melded together. Ben Donenberg’s staging transposes the action to a California vineyard, where the wine flows with the gushing force of a Francis Ford Coppola family wedding. But as the sober guest, I couldn’t help casting a dubious eye on some of the preparations." "...The Shakespeare Center of Los Angeles' starry "Much Ado About Nothing," in a too-limited run at the Kirk Douglas, never gets a complete handle on the Italianate comedy, but it would be churlish to quibble given the evening's many delights. A slew of solid performances keep the plot's stakes high. Better still, the mood set by tunesmiths Lyle Lovett, Brian Joseph and a cadre of impressive bluegrass performers, and reinforced by lighting designer Trevor Norton, couldn't be more sublime." "...The performances, particularly Ramon De Ocampo's Claudio and Grace Gummer's Hero, are so impassioned and vitriolic -- supplemented by Hero's dad (Dakin Matthews) lashing out against his only child with rash ferocity -- they all demonstrate exactly how close this comedy teeters on the brink of tragedy. This makes the choice of irony-laden melancholy country music, with an onstage band headlined by Lyle Lovett, a particularly deft juxtaposition that slathers on emotive texture like linseed oil on a raw wooden cabinet." "...So, what's to see here? Irwin's ease with the text. Dakin Matthews' charming, skillful turn as Leonato. The liveliness, luminousness, and sometimes utter conviction of Grace Gummer as Hero. Boracio's progression from pernicious to repentant, smoothly rendered by Chris Butler. And a presumably intentionally funny moment when the band plays the universally clichéd Pachelbel for the wedding scene. " "...Director Ben Donenberg achieves only partial success swirling these unusual and challenging ingredients into an agreeable stew. And sometimes his recasting of Shakespeare's story seems forced. The shenanigans and mild skullduggery surrounding a pair of developing romances are set in a California winery, which doesn't always stand in comfortably for Renaissance Messina. 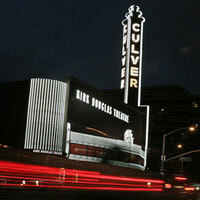 But there's enough to enjoy here to make the trek to Culver City worthwhile."